On June 16-23 this year’s ACM/IEEE-CS Joint Conference on Digital Libraries (JCDL 2016) took place in Newark, New Jersey. JCDL is a major international forum focusing on digital libraries and associated technical, practical, and social issues. 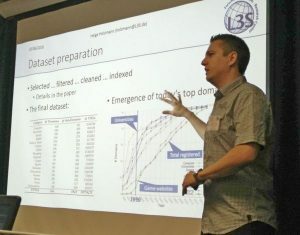 The L3S was involved in this important event with two research paper presentations by Helge Holzmann, showing results of their research in the area of Web archiving as part of the EU project Alexandria (an ERC Advanced Grant by Prof. Wolfgang Nejdl). The first paper was co-authored by Prof. Wolfgang Nejdl as well as Dr. Avishek Anand: “The Dawn of Today’s Popular Domains: A Study of the Archived German Web over 18 Years”. The second paper, again co-authored by Dr. Avishek Anand, has been joint work with the Internet Archive (archive.org) and showed their successful work on the Web archive data processing framework ArchiveSpark, developed by Helge Holzmann (L3S) and Vinay Goel (Internet Archive): “ArchiveSpark: Efficient Web Archive Access, Extraction and Derivation”. The paper on ArchiveSpark was nominated for the best paper award of the conference, which shows the need of this tool as well as the growing importance of Web archives in the Digital Libraries community. ArchiveSpark is open-source and freely available under https://github.com/helgeho/ArchiveSpark.